Experimental Scroll is either Enlightenment, Flame Blast, or Flame Cloak. Don't worry which one it is, just give it a try! 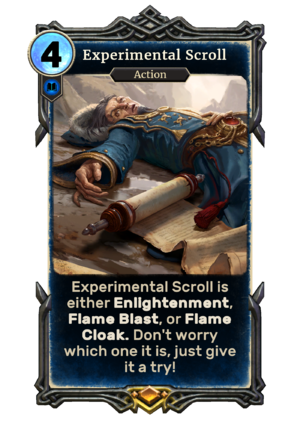 Experimental Scroll is a legendary Intelligence action card. 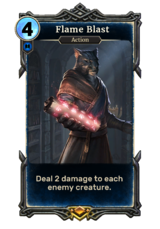 It cannot be included in a deck, but is rather added to your hand by the effects of J'zargo and Falling Wizard. Give each friendly creature two random Keywords. Deal 2 damage to each enemy creature. Deal 5 damage to each player. This card is a nod to J'zargo's Experiment, a quest in Skyrim which involved testing J'zargo's Flame Cloak Scrolls, only to find out it both damaged undead enemies and the player, much like the card's Flame Cloak effect. This page was last modified on 24 February 2019, at 11:55.